full family house in quiet area near santiago If you are looking for a complete family house in a quiet area near Santiago, you have found us! Casa da Carballeira is your house. We are just 30 minutes from the capital of Galicia, you will find a complete full family house in a quiet area near Santiago where you can enjoy the tranquility with your family. Casa da Carballeira is composed of 4 double bedrooms, with bathroom in each of the bedrooms, complete with bathtub where you can take a relaxing bath of salts and then enjoy family or friends in the complete tranquility of the rural. In addition you will have a large living room where you can enjoy conversations or games so quiet. A complete kitchen, even with the possibility of ordering food so that you do not have to cook or, if you prefer, cook the most appetizing delicacies yourself. 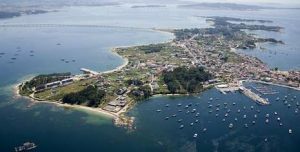 We are in the most central area of ​​Galicia, from our house you can visit all of Galicia without making long daily trips, just 1 hour from Vigo, La Coruña, Lugo and Orense. The most important cities of our community. Casa da Cabaralleira is the perfect house to come with your family or friends. You can make hiking trails through a natural and quiet riparian area, breathe fresh air and listen to the song of the birds every morning to wake up.